The previous post in this series introduced the problem of foot care for endurance and trail races, and very specifically talked about heel blisters and their cause, mitigation and resolution. During any race or event that involves dirt, water, and uneven or hilly terrain, the likelihood of developing problems with the feet increases dramatically. Certain races, too, seem to develop problems much more quickly leading many seasoned racers to exclaim “I never usually have problems like this…”. This was certainly the case at the Endurance Society event “Infinitus”. I spent the better part of 2 days working on athletes feet at Infinitus working on athletes feet, and saw a pattern of problems. The most common was related to heel blisters, and was discussed in the previous article in this series. So lets stick with the topic of blisters, and dive deeply into the cause of blisters on and around the toes, and talk about how to mitigate problems, as well as emergency solutions if these issues develop mid race. Whereas heel blisters are immediately painful, blisters between the toes tend to sneak up on you. Partially this is because the pain factor is often not too bad in most cases. That said, as toe blisters worsen, they can pop and become incredibly uncomfortable as well as becoming a risk of infection. But what causes them? Well like any blister, the causes are heat, moisture and friction. Which particular toe is affected usually depends upon your foot mechanics, but the majority of cases affect the pinky toe. Blisters between the toes occur, for the most part, when they rub against each other. This can be accelerated by debris in the shoe/sock, but is most often caused by an ill fitting shoe. For some reason, the majority of trail and running shoes on the market appear to be made for standard feet, where most endurance athletes have feet that run wider than normal. In my opinion, the majority of feet issues that appear during races occur because the toe box of the shoe is too small. Go and take a look at your shoes right now. I guarantee that most of your regular shoes, and enough of your running shoes have a taper to the toe box (the toe box, being the section of the shoe that goes from the ball of your foot to the end of your toes). In fact, this taper can be responsible for a multitude of problems. Choosing the right shoe will be a topic for another post. When the toe box of the shoe is too small, all your toes are essential mushed together. At this point, the transition of your running onto the ball of your foot and then your toes (which would ideally have your toes able to move independently of each other to compensate for unevenness in the ground) push against each other, providing the friction those blisters love. The toe box taper on shoes is usually most aggressive on the outside, and as such the pinky toe is usually the most affect. For this reason, most toe blisters I have seen impact the inside or the end of the pinky toe. Another potential cause can be time. Imagine an ultra race, or even a multi-day race/event. Imagine the pounding that your feet get. Over time, you body will direct more fluids and blood flow to your feet. At intermittent rest times, too, you will start to get edema in your lower legs, your ankles and your feet. Eventually your feet will start to swell up. This means that previously well fitted shoes now compress and crush your feet, and your toes will be affected the most. For this reason, seasoned endurance runners might carry shoes that are a half or full size bigger than they normally wear. One other cause might be poorly chosen equipment. Toe socks, such as those from Injinji or Smart Wool are popular and can be very effective. For some people, though, they don’t match their foot geometry very well. For example for me, my pinky toe is really small. I find that toe socks bunch up around and under the pinky toe actually making the risk of blisters there increase significantly. The prevention strategies for toe blisters are very similar to that for heel blisters, but in this instance equipment choice is as important as correct sizing. Equipment. First things first, make sure your toes have room. Most trail and road running shoes have a toe box that is too tapered. I am a huge fan of the Inov-8 brand. Also popular amongst runners that know their shoes is the Altra brand. A personal favorite of mine is the Inov-8 Trail Roc. This is a solid shoe, with a great grippy sole, and a nicely shaped, wide, toe box. Just like with shoes, you want to ensure that your socks fit well and do not crush your toes. My favorite, as always, are Dry Max Trail crew socks. They have a large variety of SKUs for every situation so its worth checking out their website at drymax.com. Approach 1. Once the equipment issues have been resolved, the only approach I would typically use is to reduce the chances of friction further by using a good lubricant. The only one I would use is Trail Toes Anti-Friction Foot and Body Cream. This cream really is as good as they say. It lasts much longer between applications than Body Glide, smells a lot less, and helps prevent moisture affecting the skin too. Approach 2. If you are particularly prone to toe blisters, then you should pre-tape. This is MUCH harder to do one a toe than it is on your heel, given the smaller size of the area, and the higher levels of movement. Because of this, I recommend that you tape well ahead of time, and use benzoin in an attempt to help the tape stick better. For prevention purposes, I like to use Hypafix or Trail Toes tape. They are more flexible, and thinner than Leukotape. When taping, cut the width of the tape to the height of the toe, and the length such that it wraps around the toe at most two times. Apply benzoin to the toe and wait for it to dry to a tacky state. Then wrap the tape firmly around the toe, ensuring that the closing seam ends up on the top or bottom so it doesn’t impact the adjacent toe. Next, snip down the tape tube towards the toe, and fold over itself to close off the tape tube and provide full coverage. A future post will go into details, but the important thing is to take your time here. Approach 3. Use tuf foot. I personally haven’t had much need for this product, but other races have had great success. Originally designed to protect the pads of animals feet, it is a product that is applied daily to toughen up the skin. It contains a number of herbal ingredients as well as tincture of benzoin. This is an extreme approach, but if you are particularly prone and have problems getting tape to stick, it might be worth the try. One final note. Trim those toenails. While not the cause of blisters, having the edge of a toenail tubbing against the adjacent toe will become incredibly irritating over time. Always trim your nails before a race. At a good rest point, remove your shoes and socks and take a look. Hotspots: Feel around your toes. You are looking for tenderness, or elevated temperature. That’s an indication that something is about to go bad, but that you have time to fix it. Most of the time, changing to dry socks (or wringing out the ones you have), powdering to remove moisture and reapplying Trail Toes cream is enough to keep going. You might also want to try a different style of sock. A note on powder. Its use is to remove moisture. Moist skin will break down more easily and accelerate the formation of blisters. If you apply powder to dry out your feet, but don’t remove all excess, you will start to see clumps develop once running again. These clumps can make things even worse. Therefore, any time you powder, you will want to blow and wipe away all excess before donning your socks. If a hotspot is more developed, then you will probably want to tape it. Dust your foot with a little of the powder to remove moisture, and then remove as much of the powder immediately. Use an alcohol wipe to get rid of the remainder of the powder. If your skin still feels like it won’t take the tape, you should swab the area with tincture of benzoin at this time to help adhere the tape to your foot. Apply a section of tape and tape as described in the “prevention” section above. Finally if you feel that your feet have swollen, now might be the time to switch to a larger sized, or different style of shoe. Blisters: If you see that a blister has formed, you have the same choice as with the heal. Drain or don’t drain. Personally, it is a LOT harder to mitigate a toe blister without draining than it is on the heel. The reason is mostly due to the sheer lack of space to which you can use moleskin. Therefore at this time I would take my lancing needle, pierce the blister a few times to allow good drainage, squeeze out all the fluid and tightly apply tape. The reason the tape needs to be tight is to prevent the blister refilling again. The goal of the tape is two fold. It will present the blister from refilling, and it will ideally reduce the problems caused by friction against the toe. As with the hotspots, you might want to re-evaluate equipment at this time as well. Don’t forget to apply more Trail Toes as well. 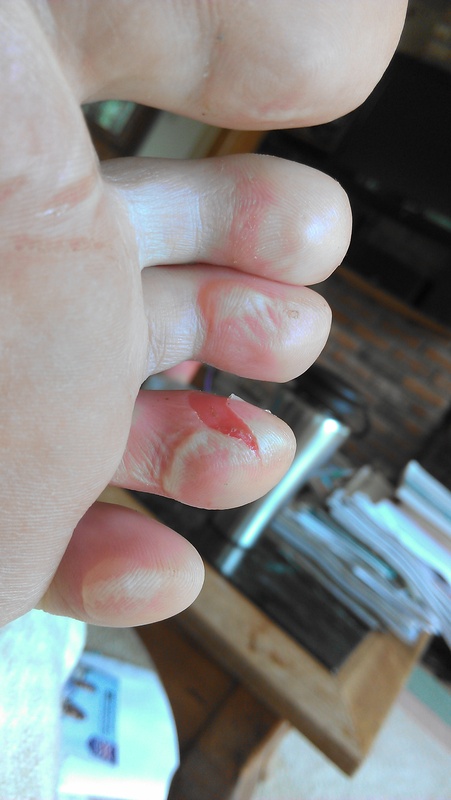 Torn Blisters: As with torn blisters on the heel, this one is going to hurt. In this situation, you continued through the hot-spot, a blister formed, and it popped and tore by itself before you ever had a chance to mitigate the problem. This is fairly common, as the toe blisters often form more slowly and its easier to ignore or not notice any pain here. As with the blister, you want to make sure you do not exacerbate the problem. You will also want to protect the new skin using a product such as New Skin. While you may choose to remove the excess skin or leave it in place, I prefer to leave the skin flap in place, apply the New Skin underneath it, and replace the skin flap back to its original position. If you can get the New Skin to dry with the skin flap on top, you have a little extra protection. Ensure that you wait for the product to dry – it just takes a minute or two – before the next step. Don’t forget, the New Skin it hurts like hell, but the burning pain does dissipate quickly. Once the New Skin is dry, you will need to protect the skin further. Again, I’d recommend taping as described above. Moving off: Now that you’re fixed up, its time to move off again. Select a dry pair of socks (or thoroughly wring out the ones you have if you want to reuse them – almost as good as brand new socks). Reapply trail toes cream, put on your socks and shoes. Make sure your shoes are laced correctly, and that they fit properly. Result of a poor shoe fit, specifically a tight toe box, plus movement of the foot within the shoe. The cause here is almost the opposite problem of blisters between the toes. The most likely cause of these problems are the same – your shoes are either too big or too loose. If you imagine that you have extra room at the end of the toe box, and your laces aren’t locked in tightly enough. Each time you make impact while running (especially when downhill), the force of your motion pushes your foot all the way forward to the front of your shoe. The push off your toes will then pull your foot back into position before the entire process repeats itself. The first issue that can happen is that as your toes push forward, the friction of the shoe and sock holds the sock in place as the tops of your toes get pulled back by the sock itself. This is exacerbated if your toenails have not been trimmed adequately. If your toenails have been trimmed, the problem isn’t removed. Even though you may have alleviated the friction pull on the top front of your toe, you might still be slamming the front of your toe into the from to the toe box of your shoe. Its also possible that the bruising is caused by shoes that are too small. If the toe box is large enough that it prevents the toes from being squeezed together, its still possible that they are too tight against the end of the shoe. Do you see the importance of a properly fitting and laced shoe? Prevention here is a multi-part strategy. First you will want to ensure your toenails are trimmed, and filed. Properly trimmed toenails should prevent snagging on your socks but not be taken so short that you risk in-grown nails. One trimmed, file the corners, and along the top edge to again reduce the risk of snagging the nail. Next you will want to ensure that your shoes are correctly sized and laced. It isn’t necessary for the toes to be snug against the end of the shoe, but it is necessary that as you run the foot stays put within the shoe. Correct sizing and lacing is key. If you get blisters beneath the toenails, or they feel bruised, you don’t have a huge number of choices. Draining blisters beneath a toenail is tricky. If the blister is exposed at the front, you can pop it there. If it isn;t exposed at the front, you can heat up a needle and pierce through the nail into the blister. The heat here ensures that very little pressure is needed to pass through the nail. Once blisters are drained adequately, you will need to stabilize and protect the toe. For this I will tape with Leukotape. Its stiffness will help provide some protection.You should tape down as hard as you can stand. The idea here is to prevent the blister from refilling and also protect the toenail from movement. If it looks like you might lose the toenail (likely at this stage) you might want to put some gauze or the cut pad from a bandaid against the toenail in order to prevent the tape from sticking to it and tearing it off when you remove the tape. You will also need to determine what caused the problem and resolve that. If your shoes are too tight, select a larger size. If there is no larger size, I’ve seen athletes in extreme circumstances cut away the font portion of the shoe. If your shoes are too loose, you should change how you lace them, or don socks that have more padding. If you think your shoe is fine, its possible your socks are too tight. In fact a general strategy WHENEVER you see issues develop with your feet is to modify the equipment. Changing shoes or socks is an easy way to change the pattern of damage on your feet. Once you get moving with blisters under the toenails, you will never completely alleviate the pan. It is tempting, as the pain gets worse, or even when it appears, to keep your shoes on and ignore the pain. Sometimes this might work, but you will always want to identify the problem, its cause, and try to resolve it. Otherwise things can get really bad really quickly. This applies to any types of issue but I know from experience that this particular one is more tempting to ignore. The shopping list remains the same as the last article, mostly using the following for prevention and triage purposes. Trail Toes – the BEST product to protect your feet (and other areas) by far. Far superior to body glide. Tincture of Benzoin – use to provide enhanced adhesion of tape to skin. Can also add a protective barrier like New Skin, but takes longer to dry. Scissors – duh. cuts the tape, moleskin, etc. For prevention purposes, Leukotape, Trail Toes, and foot powder will be the best tools in your arsenal, along with good equipment. Thank you , very well writen amd helpfull adding the necessery shopping list.